The Skinny: Eight short films with overlapping themes and characters based on the actual dreams of director Akira Kurosawa. Magicvoice: Akira Kurosawa's Dreams is comprised of eight short films, each featuring a character named "I," who we are to assume is Kurosawa himself. 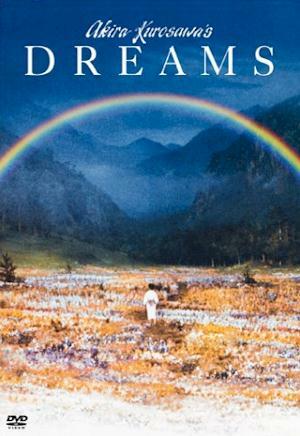 The film begins with two dreams from Kurosawa's childhood and eventually move into adulthood. One tale, "Crows," expresses Kurosawa's love for the artist Vincent Van Gogh, and is the most questionable of the eight tales. An art student enters the paintings of Van Gogh and meets Van Gogh, played here by American director Martin Scorcese. It's interesting that Kurosawa cast Scorsese to play Van Goghperhaps he felt that only another auteur could fully grasp the creative compulsion of Van Gogh. That point is not lost on the viewer, but it still would have been preferable to cast a real actor in the part. Scorsese's New York accent just doesn't fit the film. The best segment of Dreams is "The Tunnel," which is directed by an uncredited Ishiro Honda (Godzilla). It tells the tale of a military officer who is confronted by the spirits of his dead platoon. Heartbreakingly, the officer apologizes for his actions, which led to the death of his men. He takes responsiblity instead of simply blaming the stupidity of wara universal theme that people today could perhaps learn from. "Mt. Fuji in Red" and "The Weeping Demon" both deal with nuclear disaster and a post-apocalyptic world. They pretty much hit the viewer over the head with Kurosawa's (and Honda's) views on the destruction of nature and the stupidity of mankind. Since we currently live in an era where world leaders propose to cut down trees in order to avoid forest fires, some people may still need that point to be drilled into them. The last segment shows what would happen if we did things Kurosawa's way. The people in "Village of the Watermills" live at one with nature and are rewarded with health, happiness and long lives that are celebrated upon conclusion. It's the most beautiful dream of all, and a perfect ending to a great film.